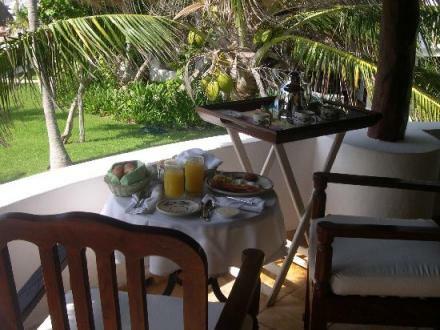 Maroma Resort and Spa is an award winning luxury beach hotel. 2008 Travel and Leisure voted it Worlds Best Hotel Spa in Latin America. Ranks 5th best hotel spa in the World. This 5 star boutique hotel and resort is located on Maroma Beach which has soft powdery sand that could not be more perfect. The beach is wide and clean and perfect for long walks or playing in the ocean. Coral reefs with huge corals and colorful fish are right here under the sea! Located on the corner of the Yucatan Jungle in Riviera Maya. On 25 acres on a jungle preserve and 45 min. south of Cancun. This Riviera Maya resort and spa is adorned with overstuffed chairs, curving staircases, paths with clipped hedges and terracotta pots and fresh flowers. Yes! There are 3 restaurants at Maroma Resort and Spa. The restaurants are not included in your rate, so you pay for each meal. However, at the end of each meal you don't sign anything or pay. You get your bill when you checkout at the end of your stay. Mariachi bands play at dinner for you which adds to your Mexican ambiance. Staff are always nearby to bring you a cold towel or drink! You can enjoy a gourmet picnic with a bottle of wine for lunch on the beach. After dark, staff put candles on dinner tables to give you complete privacy as you eat on the beach. How romantic! Your rate includes FREE daily a la carte breakfast, welcome cocktail, one snorkeling trip per guest, round trip airport transfers, fitness center and internet access. lounge with pool table and grand piano. The Palapa Cultural is open 24 hours a day and has books, magazines and free internet access..
El Tambor is open 24 hours a day and has TV and movies. Shopping in the boutique with unique lines of clothing, jewerly, pottery and glass. Check out the observation tower that has a 360 degree view of Maroma's bay and jungle. You will definitly want to lay out on these by the beach! What are the rooms like at the Maroma Resort and Spa? 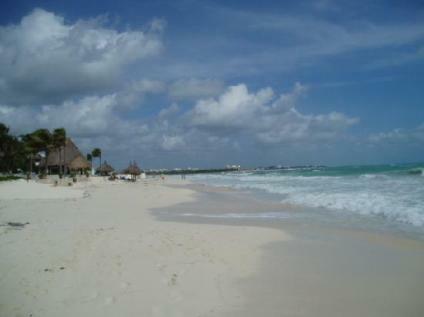 This Riviera Maya hotel on Maroma Beach offers lots of rooms! They all come with mahogany and bamboo woods, handpainted tiles, soft wool rugs, original art, King beds, sunken tubs, a/c, hairdryer, daily housekeeping, umbrella, aromatherapy nightly turndown, morning coffee delivered to room, terraces with bamboo shutters and safety box. Garden view: located by one of the 3 pools, surrounded by gorgeous foliage and shade. Junior Suite: has sitting area, thatched roof terrace, outdoor living room and panoramic views of sea. Master suite: has large living room and is HUGE! Sian Nah Suite: ultra luxury! 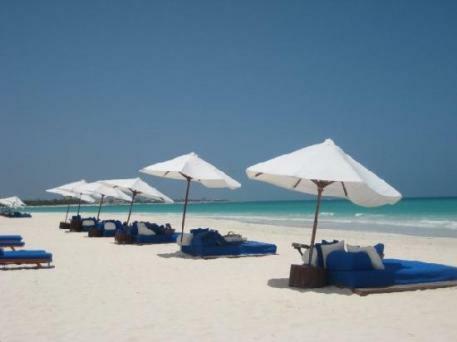 Oceanfront, private plunge pool, ultimate Spa products, beach bag, sarong, maroma cap, aloe vera, Kaftan and slippers. Villa Karolina: 4 bedroom, 4 1/2 bath up to 8 guests. Has 2 master suites on the ground floor. The staff at Maroma Resort pay attention to detail and leave notes adn sweets on your pillow each night. Your room has 2 small bottles of complimentary water each day. 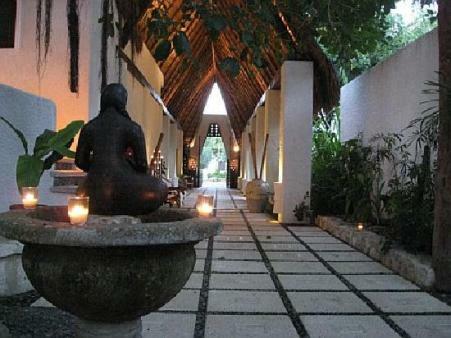 The Kinan Spa has treatments based on ancient mayan healing! There are tons of treatments and massages available.